As a writer, Richard is known for his writing, directing and producing almost 24 of his own plays, and well as directing many other artists. He toured nationally with his hit solo show “Sober But Never Clean” performing it sixty times in comedy clubs, theatre festivals, treatment centers and recovery conventions to rave reviews and standing ovations. His Ontario Arts Council financed CD of the same name is a popular item on SoundCloud (https://soundcloud.com/user-646720012-647951782) . His new solo show about his journey with testicular cancer, entitled “One Nut Only” performed November 4th, 2018 to kick off the Movember Foundation fundraising month for men’s health. His latest stand-up CD “Living Clean and Talking Dirty” is available online (https://soundcloud.com/richardglenlett/living-clean-and-talking-dirty-richard-lett ). As a spoken word artist – under the moniker OPTIMUS RHYME, Richard wrote and performed slam poetry on his way to the Vancouver Poetry Slam finals in 2008, and to being Toronto’s 2013 Grand Slam Poet Champ and captain of the 2013 Toronto Poetry Slam Team. Competing in Boston at the National Poetry Slam in August that year, he won the Toronto’s 2013 Word On The Street Slam. In November he and his TPS teammates won the 2013 Canadian Festival of Spoken Word National Championship. His comedy can regularly be heard on Sirius XM radio, and while living in Toronto he was the sidekick and co-host of Canadian tv and film icon Frank D’Angelo for four seasons. 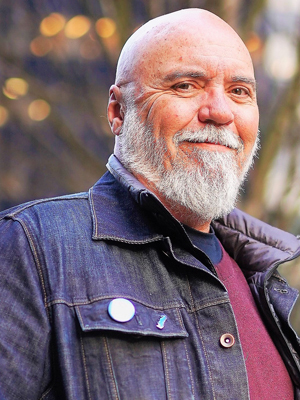 Richard now lives in Vancouver where he is regularly seen on local stages doing stand-up or performing at poetry slams or singing and playing original songs on the piano. He frequently does charity work in support of men’s health and addiction and alcohol recovery. His portrait photography is also popular and can be seen on Instagram @richardlettphoto.